Wholesale Cooler Duffel Sports Bags, Personalized with Custom Imprint or Blank. 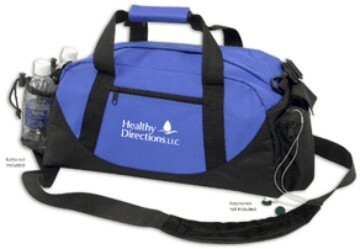 Bulk cooler sports duffel bags combine two functions: a large sports duffel bag and an insulated cooler for 24 of 12 Oz. cans and more. Our bulk cooler duffel bag can be custom imprinted with your logo or message and comes in many colors: Black, Burgundy Red, Forest Green, Navy Blue, Red, Royal Blue, Purple, Gray, Athletic Gold with Black Contrast Trim and Black Bottom. We also supply wholesale blank (not imprinted) cooler duffel bags for $14.95 each. Budget Prices in the USA for wholesale cooler duffel bags. American clients pay no taxes. We will send you a proof for your approval before production. Prices include your 1 color, 1 location custom imprint. Setup Charge is $45.00 per color. You may order any in-between quantity; assortment of colors is allowed. Please multiply all US prices by 1.30 to find CAD$ prices. It holds 24 of 12 Oz. cans with extra room. Colors: Black, Burgundy Red, Forest Green, Navy Blue, Red, Royal Blue, Purple, Gray, Athletic Gold, all with Black Contrast Trim and Black Bottom (see photo).